The five rallies – constituting the Batein Aman Ki rally – will culminate in Delhi on October 13. The third segment of Batein Aman Ki rally passed via Chennai on Tuesday. 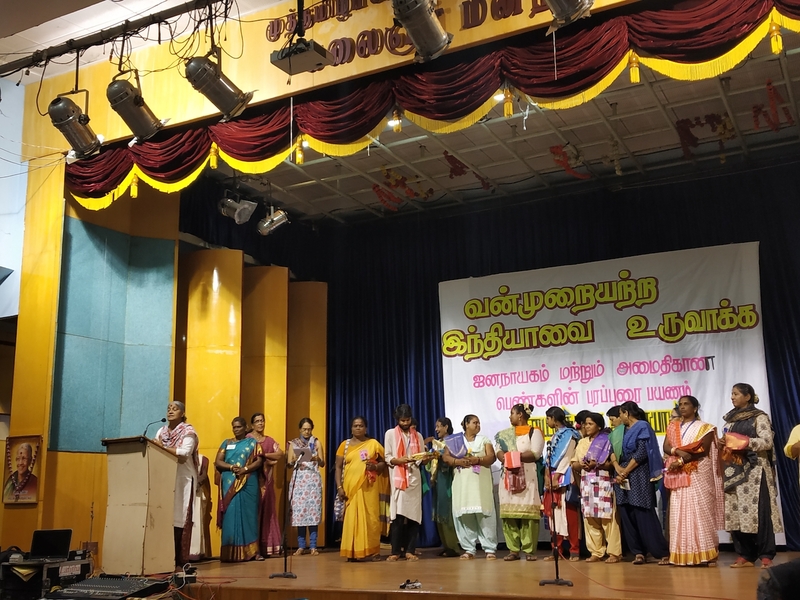 It is a rally organised by a collective of women organisations across India carrying the message of peace and harmony and constitutional values. There are five rallies being held at the same time namely Ekjuta (Kerala to Delhi), Maitri (Kashmir to Delhi), Ekta (Kanyakumari to Delhi), Nyay (Johrat to Delhi), and Samanata (Delhi to Delhi). They started on September 20, and will culminate in Delhi on October 13. Each jadha (rally?) team consists of 20 to 25 people, mainly women. Local women groups are organising programmes to recieve jadhas in every state. The reception so far has been unsurprisingly huge, says Annie Raja, general secretary of National Federation of Indian Women, while speaking to Newsclick. She was in the Ekta rally that started from Kanyakumari. They were received in Chennai by a crowd of nearly 700 people. The programme was organised at the TN Rajarathinam Pillai Muthamizh Peravai Hall in Raja Annamalai Puram. People from different strands of life gathered to meet the rally members. The team members coming from different states talked about the hostile environment in the country. When asked about the initiative, Raja said, it is high time that we join hands regardless of differences in opinion against this fascistic government. “This is a rare moment where women are conducting a rally that is exclusively not for gender issues. The government says they are making no changes to the Constitution. But, they keep on working to break every constitutional values. Batein Aman Ki resolves to galvanise men and women in this country to reinstate the constitutional values,” said Raja. She questioned the slogan of Modi government – Sabka saath, sabka vikas. She pointed out that the president, the vice president, prime minister and home minister of this country are self-proclaimed sangh pracharaks. “The ideology they follow exclude Dalits and minorities. They have claimed to make India a Hindu rashtra by 2025. They began their work by attacking Christians and then Muslims. Mob lynching and detention of anyone who raise voice against the government is becoming common. Even the minorities from the Hindu community are not safe. Their idea of a Hindu rashtra is brahminical,”said Raja. She also said that the government is scared when women gather round to raise issues. She alleged that the UN women backed out and withdrew their support for the rally at the last minute because of the pressure from the high level. Initially, UN women had reportedly promised to give the group vehicles and other things which was revoked later. “They made it clear to the group that they are facing severe pressure,” she said. .The group is planning to continue working together even after the rally to address such issues and to mobilise people to raise their voice. The Ekta rally that began from Kanyakumari covers Tamil Nadu, Andhra Pradesh, Telangana, Odisha and Chathisgarh. Ekjuta, led by activist Shabnam Hashmi is passing through Kerala, and will cover Karnataka, Maharashtra and Gujarat. Maitri rally covers Jammu, Himachal Pradesh, Haryana, and Punjab. Nyay rally covers Assam, West Bengal and Bihar and Samantha rally covers Uttar Pradesh, Madhya Pradesh, Rajasthan and Jharkhand.